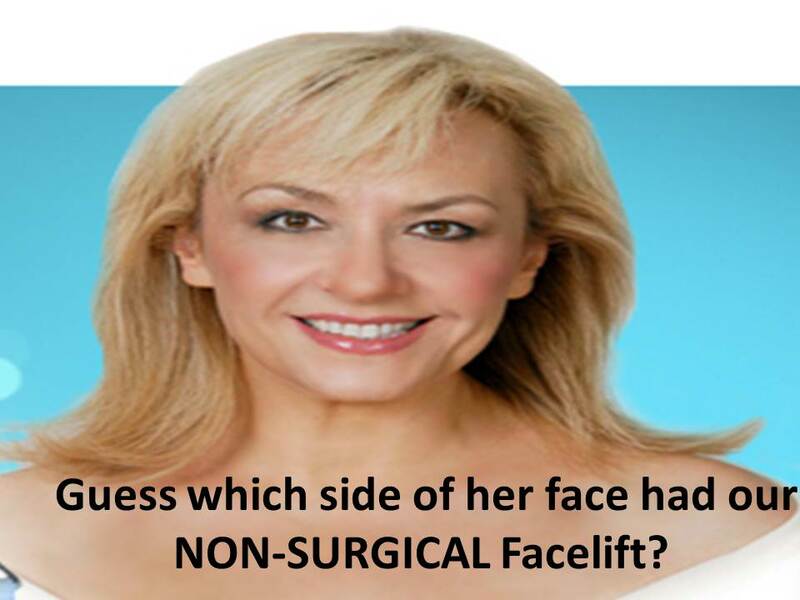 Can you get a face lift without surgery? Yes! 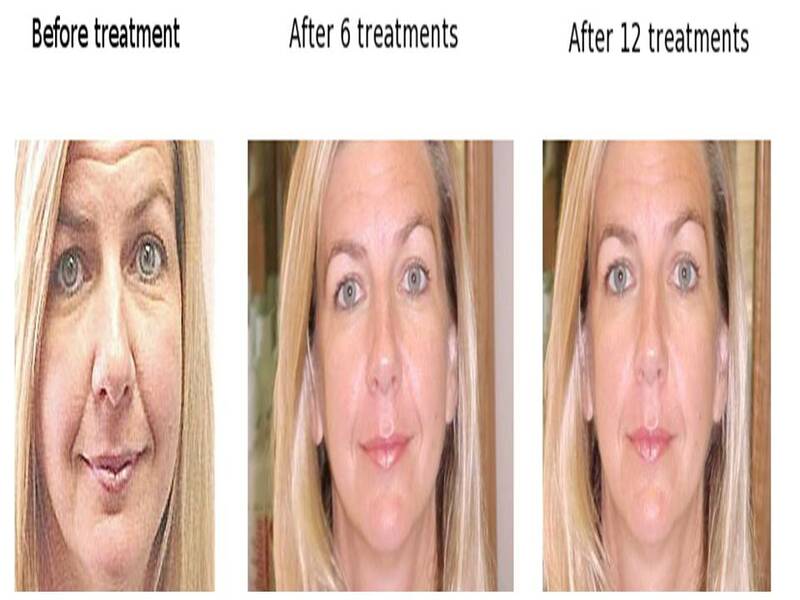 It’s called a “Non-Surgical” Face Lift with Microcurrent. 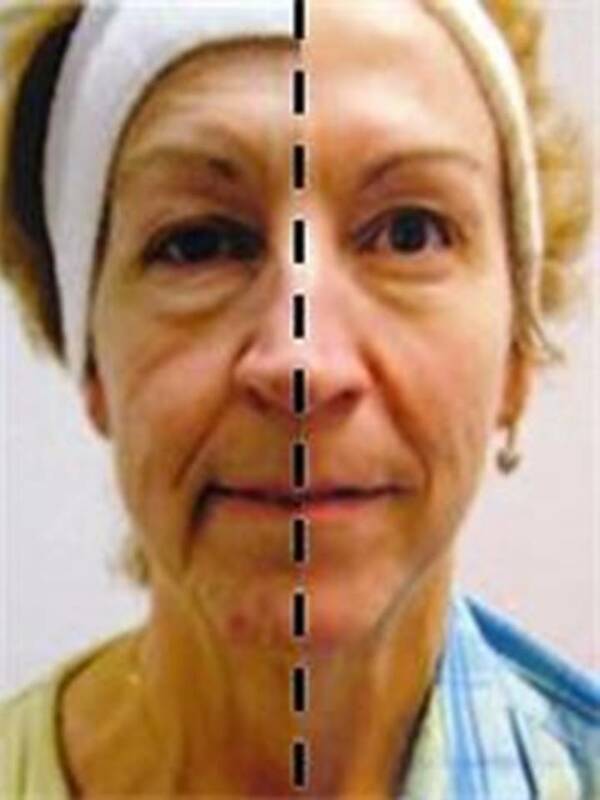 Results from our Microcurrent facial Plano are fast and immediately visible. Just like going to the gym to workout the muscles of your body to keep them firm, tight and looking good, you can also workout the muscles of the face and neck. 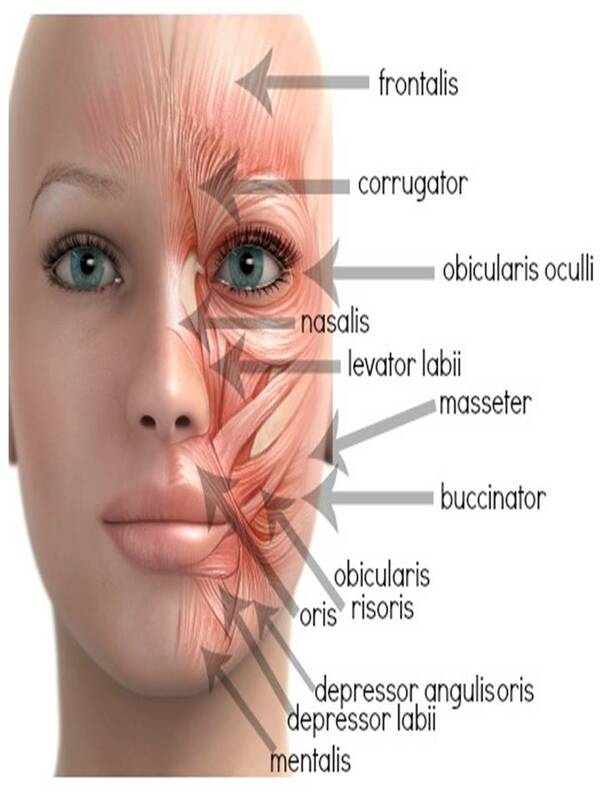 In fact, the face is the only place where the muscles are attached to the skin. This is why the face responds so well to Microcurrent. Microcurrent has been tried, true and tested for over 100 years. Starting in the 1830’s. Carlos Matteucci proved that muscles, even injured tissues generated an electrical current. Fast forward to 1843, Dubois-Reymond began his research on electrical current on existing and injured tissue. Later the Japanese during the mid 20th century used Microcurrent on injured WWII soldiers to heal non-healing bone fractures and discovered it speed up the healing process. Orthopedic surgeons began using Mircocurrent for bone implants when Microcurrent became accepted after the first commercial device was developed by Dr. Reinhold from Germany, nearly 20 years after WWII. From this advancement doctors, chiropractors, physical therapist, and acupuncturist began safely using Microcurrent for paralysis on stroke and Bell’s palsy patients. After their treatment, it was evident that the current stimulated not only the dormant nerves, but the muscles too. Fine lines and wrinkles were gone, only the side of the face being treated was lifted! Clients looked like they had a face lift, but only on one side of their face! 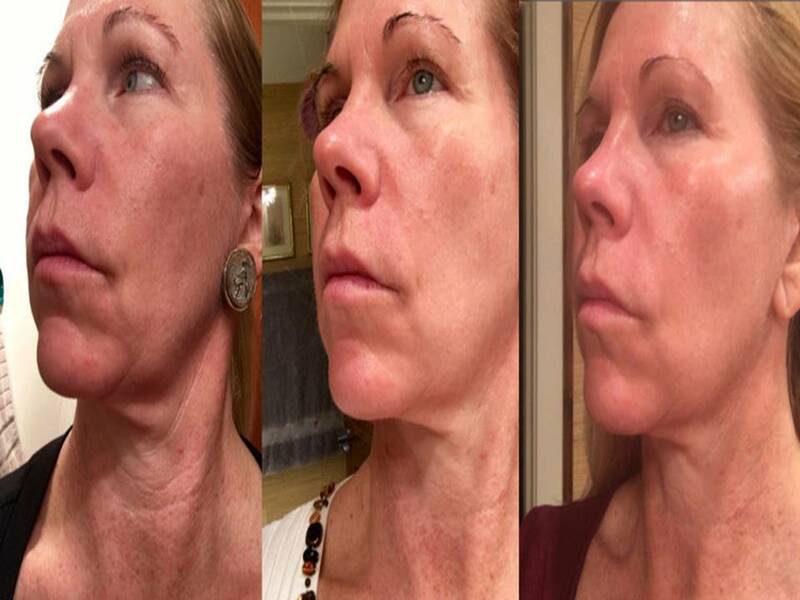 Finally a more youthful appearance without surgery or downtime! We’d love to see you weekly and perform Microcurrent on you, or you can perform Microcurrent on your face just 5 minutes a day! 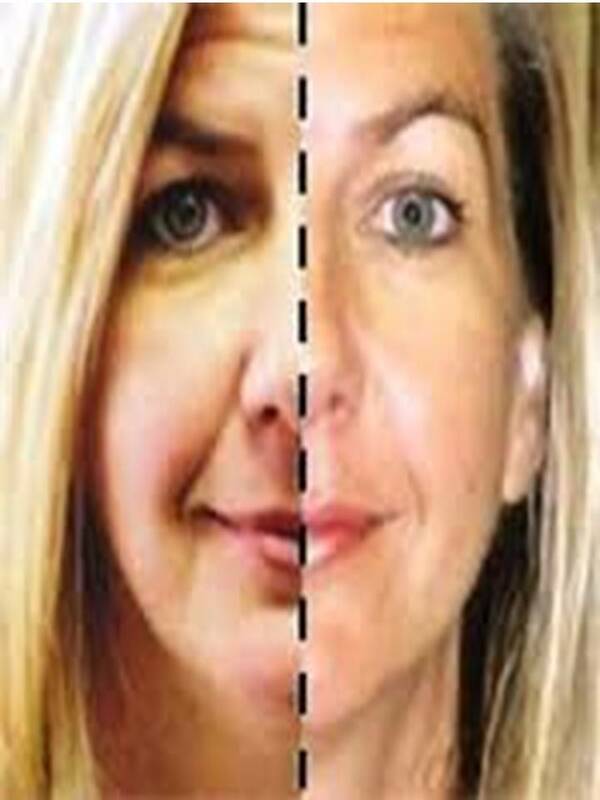 Either way, the minute you begin to see sagging skin and jowls is when you need to start using Microcurrent. It’s never to late to begin. Benefits begin the minute you introduce Microcurrent to your face and body! Yes, you can use Microcurrent on your whole body, it’s truly amazing. Say good-bye to sagging knees, back sides, droopy, skin and upper arms and more! and get better and better over time. Here is our offer to you! Experience what LED and Microcurrent can do! Truly the best, fastest, ultimate skin rejuvenating facial you could ever have without surgery, downtime, redness, irritation or recovery! A Custom double cleanse, chemical Peel, LED, and Microcurrent, moisturizer and spf! And yes! Membership has its discounted benefits too. For the Best Microcurrent facial in Plano! 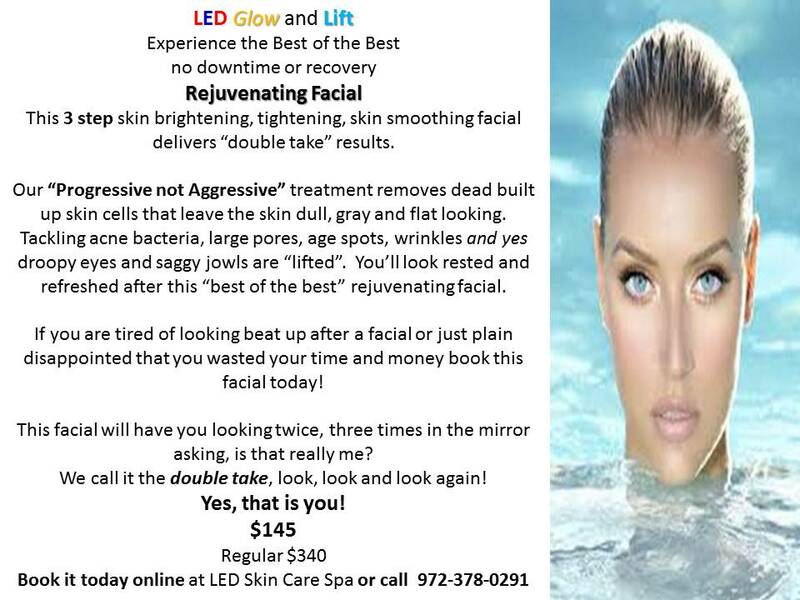 LED Glow and Lift Facial.